Insurers Hire Social Workers To Tackle The Opioid Epidemic : Shots - Health News Some health plans in Massachusetts are putting tighter limits on painkiller prescriptions. Others are hiring their own social workers to help customers who struggle with opioid abuse quit for good. A pharmacist counts pain pills. 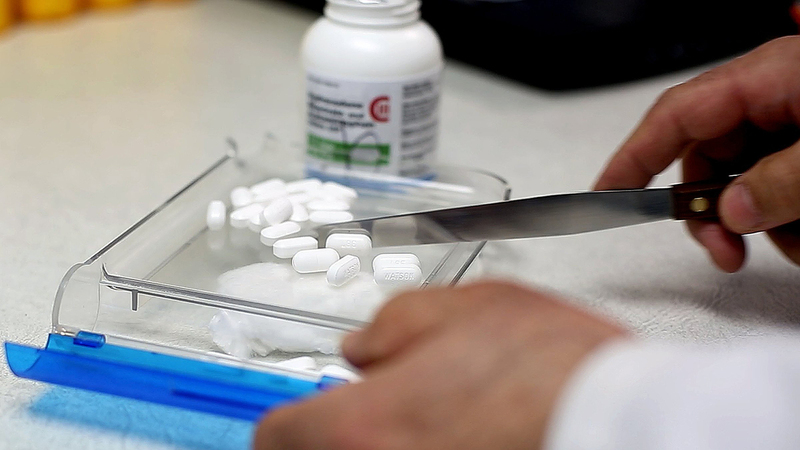 In an effort to curb the abuse of Oxycontin, Vicodin and other opioid painkillers, some health plans in Massachusetts now limit a patient's initial prescription to a 15-day supply, and plan to halve that number in February. "Having Will is the best thing in the world for me," Andrade says. "Because if I have the slightest issue with anything to do with my insurance that includes, like, prescriptions — even when I had a court issue — I know that I can call him." Andrade's insurer is CeltiCare Health Plan, one of several health insurance companies in Massachusetts taking aggressive new steps to deal with the growing opioid epidemic. CeltiCare has about 50,000 members in the state, and mostly manages care for patients on Medicaid. Insurers typically cover some inpatient substance use treatment and detox, says CeltiCare's president and CEO Jay Gonzalez, but those are only short-term solutions. After a patient is discharged, relapse — and readmission — are likely without follow-up support. That's why CeltiCare assigns social workers to some of the people it insures. "This is the biggest potential solution to this problem, I think, because at the end of the day we have to find the members who are or could be in trouble, and we need them to be invested in addressing their issues," Gonzalez says. For CeltiCare, the costs related to the opioid epidemic are huge: Nearly a quarter of its hospital admissions are related to substance use, Gonzalez says. The insurer spent more than 10 percent of its budget last year on Suboxone, a medication to treat addiction to narcotics. That's more than it spent on any other drug. Gonzalez believes that investing in the extra attention to patients like Andrade will eventually pay off, by helping them stay sober for good. "At the end of the day, we think it's going to cost a lot less, Gonzalez says. "They're going to be healthier; they're not going to be showing up in the emergency room. We have people who show up in the emergency room 50 to 100 times a year. That's very expensive, and it's not good for the member." CeltiCare is also training some of these members and their families in how to use Narcan, the drug that reverses an opioid overdose. And the firm is putting tighter limits on the initial prescription of opioid painkillers it permits for each patient. CeltiCare isn't the only health insurer looking for new ways to deal with the opioid problem in Massachusetts. For the past three years, the state's largest insurance company, Blue Cross Blue Shield of Massachusetts, also has been limiting the supply of opioids it allows patients in an initial prescription. Dr. Tony Dodek, associate chief medical officer for the company, says about 11,000 of the insurer's more than 2 million members were treated for a substance use problem in the past year. Federal numbers show that most misused controlled substances originate as legal prescriptions, so he sees limiting prescriptions as one simple and straightforward way to deal with the problem. "We decreased the number of doses in circulation — when you compare the three-year period after implementation to the prior period — by over 21 million doses," Dodek says. What's not so easy is finding ways to keep patients out of the hospital. Between 1993 and 2012, the rate of inpatient hospital stays related to opioid use went up 150 percent across the country, according to data from the Association of Community Affiliated Plans, a group of 60 not-for-profit health plans in two-dozen states. In response, several of the association's members across the country are now taking steps that include screening those they insure for substance abuse, using social workers to help keep them in treatment, and improving the use of medications like Suboxone. Neighborhood Health Plan in Boston is one of those plans. Its chief medical officer, Dr. Paul Mendis, says the insurer has developed algorithms to identify who is at risk for relapsing after drug abuse treatment, and has hired social workers to reach out to those members. Mendis says they look for members who have a traditional medical diagnosis as well as a substance use issue. "You actually have to, in many cases, reach out using their other medical diagnosis as the reason for the outreach," Mendis says. "If you just call somebody cold and say, 'We found you,' I don't think those calls would be well-received." The health insurer is also piloting a program in which a recovery coach is assigned to members who land in the hospital after an overdose. For any such program to work, the person with the drug problem has to trust the insurer's recovery coach, social worker or case manager. Andrade says she quickly came to trust her case manager, even though many other people in her life have let her down along the way. She started using drugs as a teenager, she says, after both her parents left home and she was essentially homeless. She temporarily stayed in foster care and with various family members or boyfriends — some of them abusive. Her son was born six years ago, but she lost custody and her drug use spiraled. The case manager from CeltiCare is now working on helping her find a job and more permanent housing, she says. And he and others are holding her accountable in ways she believes will help keep her on track in her recovery. "I have, in one of my poems," Andrade says, " 'Don't let anyone diminish your self-confidence, your pride. If you feel something, it means that you tried.' I at least want to try for all the people that tried for me." A version of this story ran on WBUR's blog CommonHealth, where you can find more coverage of the opioid addiction crisis in Massachusetts.